The hand has high blood circulation. The arteries of the hand are ending portion of the ulnar and radial arteries which, respectively in each hand after going inside the palm create superficial and deep palmar arterial arches. 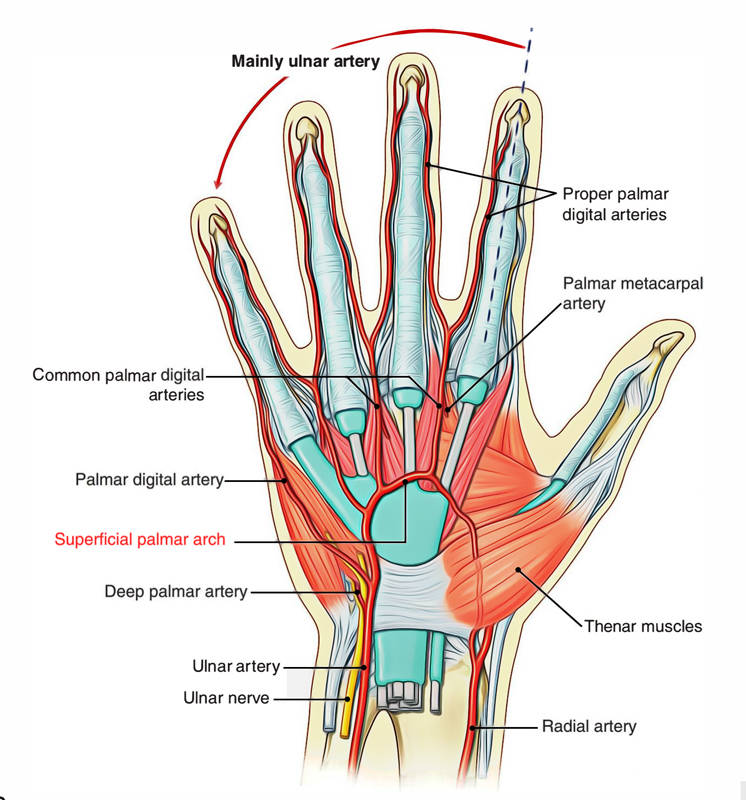 The superficial palmar arterial arch is the primary extension of ulnar artery, is superficial palmar division of the ulnar artery away from flexor retinaculum. The artery turns laterally after inserting the palm at the back of the palmar aponeurosis and also in front of long flexor tendons. The convexity of arch is pointed towards the digits. The ulnar artery together with ulnar nerve gets into the hand at the medial side of the wrist. The vessel is located among the palmaris brevis as well as the flexor retinaculum and also lateral to the ulnar nerve along with the pisiform bone. The arch connects with a palmar branch of the radial artery on the lateral side of the palm. The superficial palmar arch is located in the level of the distal boundary of the completely expanded thumb throughout the centre of the palm. Distally, the ulnar artery is medial towards the hook of the hamate bone and afterwards sways laterally over the palm, creating the superficial palmar arch that is superficial towards the long flexor tendons of the digits and also simply deep towards the palmar aponeurosis. Superficial palmar division of the radial artery (most common). Three common palmar digital arteries reach the interdigital clefts among the fingers then each split within two proper digital arteries that supply their adjacent parts. In the inter-digital clefts, they are connected by the palmar metacarpal arteries. One proper digital artery travels to and circulates the medial part of the little finger. Cutaneous branches towards the palm, which circulate the skin along with superficial fascia of the palm. Three large, common palmar digital arteries that ultimately supply the main blood supply towards the lateral side of the little finger, both portions of the ring as well as middle fingers, along with the medial portion of the index finger. They are connected by palmar metacarpal arteries coming from the deep palmar arch before dividing within the proper palmar digital arteries, which go into the fingers. Long flexor tendons of FDS and FDP. Digital branches of the median as well as ulnar nerves. The lacerated injuries of palmar arterial arches generally cause excessive and uncontrollable bleeding. One of the most effective techniques is the compression of brachial artery in opposition to humerus in order to control the bleeding. Due to attachments of these arches together with the palmar as well as dorsal carpal arches, the ligation or clamping of the radial artery or ulnar artery or both of these proximal towards wrist cannot control the bleeding.